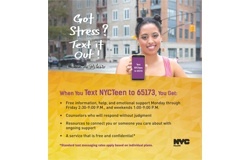 New York City First Lady Chirlane McCray, her daughter Chiara de Blasio and First Deputy Health Commissioner Dr. Oxiris Barbot have announced the launch of Teen Text, a new mental health resource for teens at 10 high schools throughout New York City. Teens at these schools can text “NYC Teen” to 65173 to receive prompt, confidential information and emotional support from trained LifeNet crisis counselors. The innovative program is available Monday through Friday from 2:30 PM to 9 PM and on weekends from 1 PM to 9 PM. Read more about this new initiative in The New York Times here. The Daily News carries the story here. The Wall Street Journal, CBS New York, and The New York Observer all cover this new initiative as well.